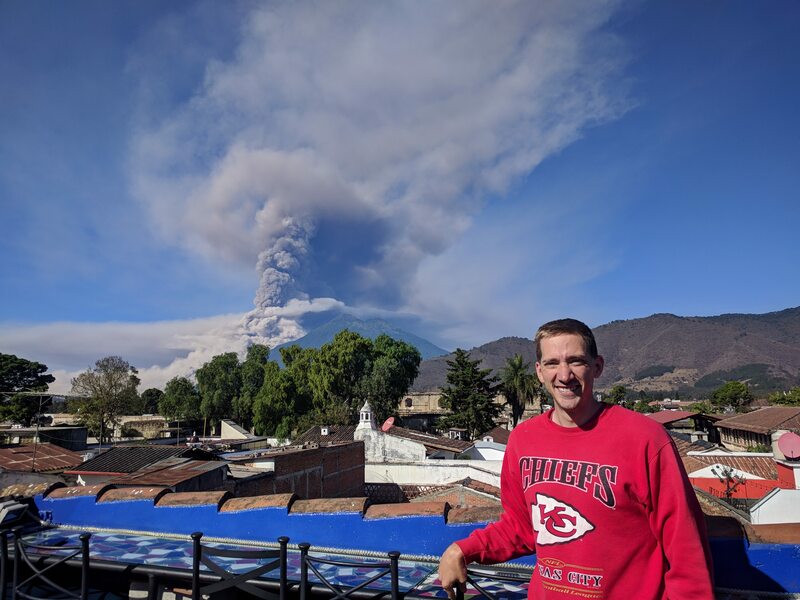 When you’re from Nebraska, waking up to a volcanic eruption is kind of a big deal. 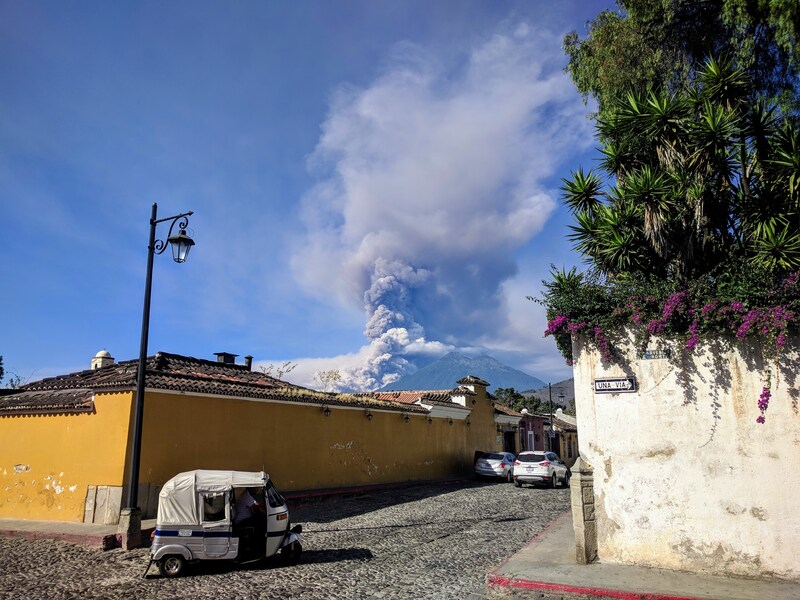 When you’re from Antigua Guatemala, it’s just another regular Thursday. There are lots of things to see in Guatemala. 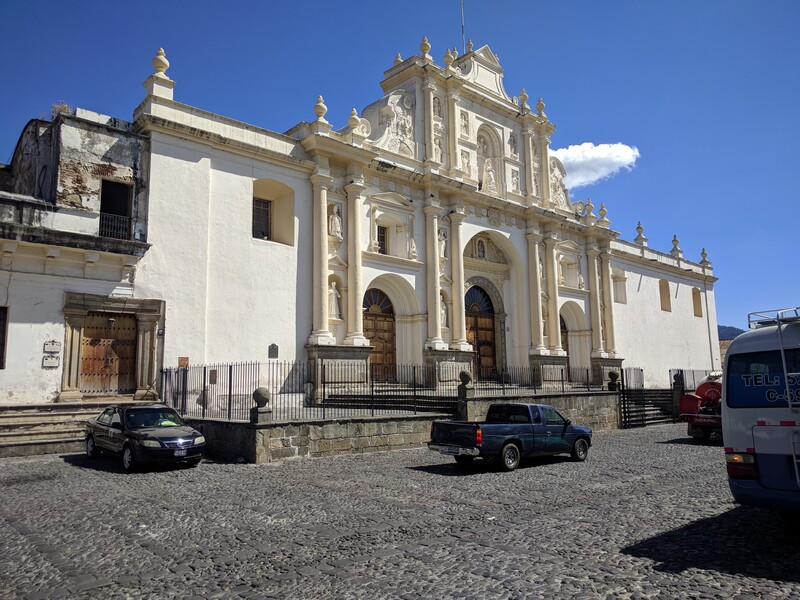 On this visit, I would only be visiting a couple of the most popular tourist locations: Lake Atilan (last episode) and Antigua Guatemala (this episode). On my return trip, I plan to see more of the country, especially the northern part. The ruins at Tikal are still high on my list. 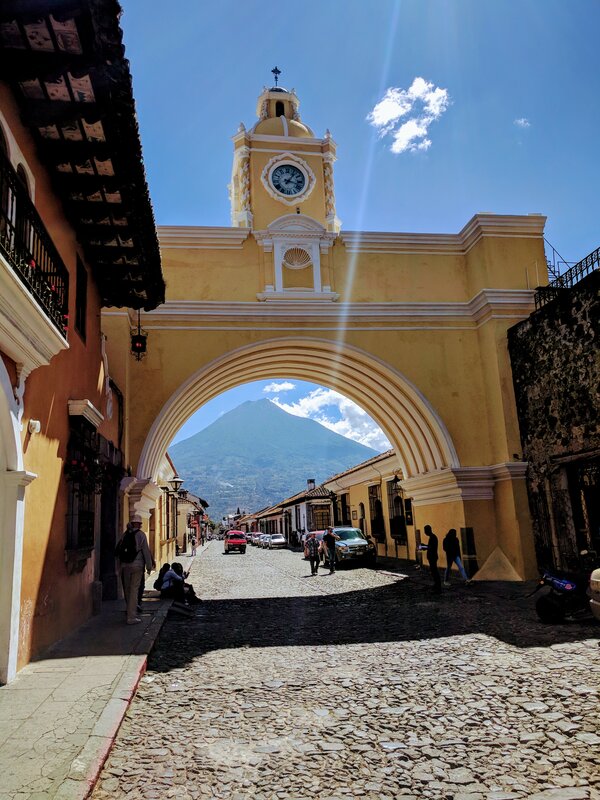 “Antigua Guatemala” literally means “Ancient Guatemala.” This is due to its history as the former capital of the country. 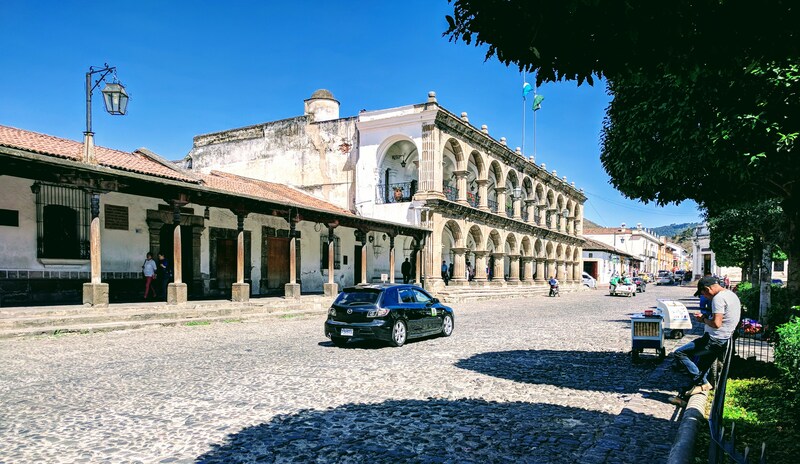 After a series of earthquakes in the 1700s, the capital was moved to the east to present day Guatemala City. But not everyone left this place, and in recent decades the city has had a major rebirth as a tourist destination and even a place to live for expats. The winding road that climbed out of the valley only had one lane open, so I had about a 30 minute wait before I could pass. I made some new friends and got to practice Spanish, so it didn’t bother me. By mid afternoon, I made it to Antigua. The roads here are definitely “antigua,” haphazard and uneven cobblestone. I met the owner of the first bike, Ben from Colorado, right away (I guess I never got his picture though). We got to swap some stories and talk about common places that we had visited. I pointed to the other bike and asked if he was travelling with “that guy” too. “That guy” ended up being Mary from Quebec (add male chauvinism to my list of faults). She is still fairly new to riding and has had a wild journey so far. 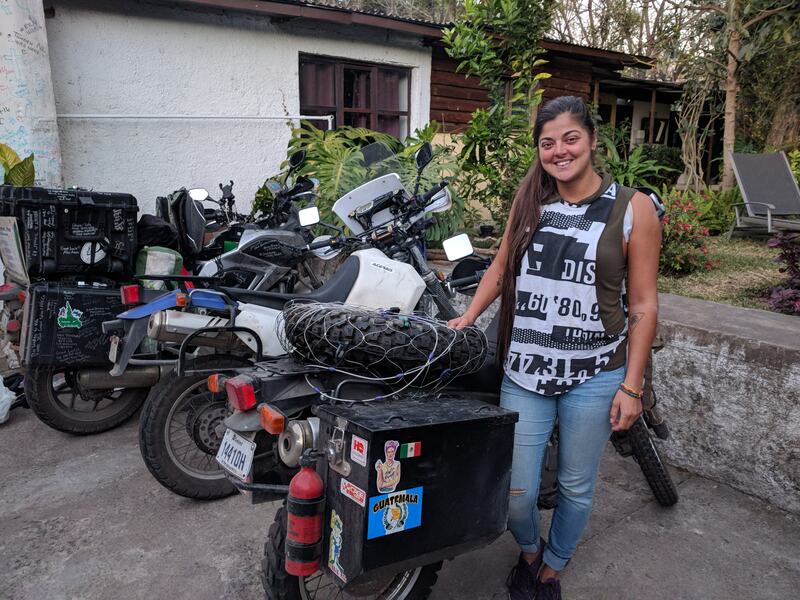 She has had two fairly major crashes, both of which cost her a broken collarbone. Still, she had a great attitude and seemed to be enjoying her journey. I had a calm evening of typing and relaxing, with just a brief stroll to grab some street food. $301 spent, 29 nights paid (2 nights free camping), average of $9.71/night. $90 spent, 1,840 miles, 27.92 gallons, 65.9 miles/gallon. Obviously there are lots of other expenses, but these core categories are fairly close to my estimations. I’m still feeling fairly confident about the budget. The hostel provided a nice breakfast. 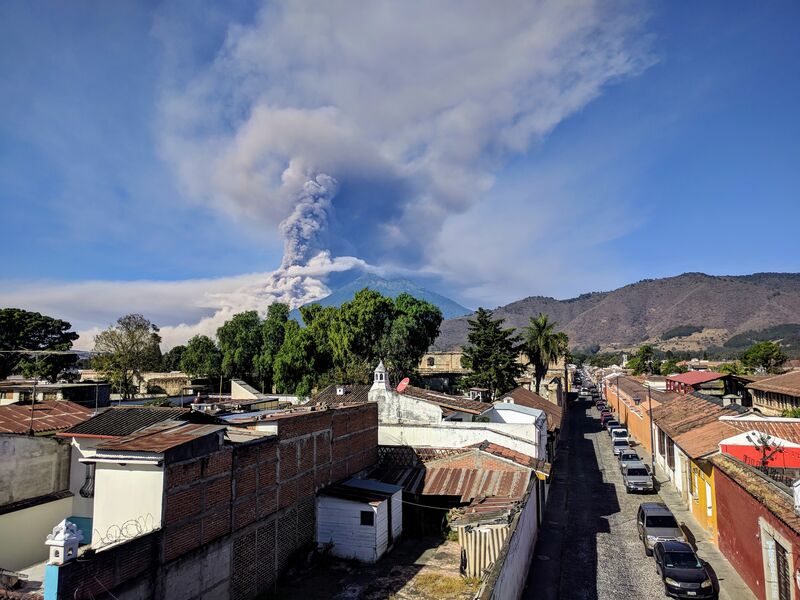 Shortly thereafter, it came to my attention that one of the three volcanoes that surrounds Antigua, Volcan de Fuego, was having an eruption. My new friend Darren and I wanted to find a better view. Christian said that there was a cafe close that had a third floor terrace. We walked over there and got some great views. The waiter brought us a menu, but we just left a few Quetzales (Guatemalan currency) for the use of the view. I only had one full day here, so I’m not sure if I can offer too many relevant observations. I feel like it is a place where people come “to be” rather than “to do.” There’s definitely a charm to Antigua. I was able to find a “Ferreteria” (a hardware store, not a pet store that specializes in ferrets) and get a couple of bolts that I needed to fix the hand guard that had been damaged in the crash. I completed a couple of other mechanical things as well. I spent a good chunk of the evening doing research for my border crossing into El Salvador the next day. 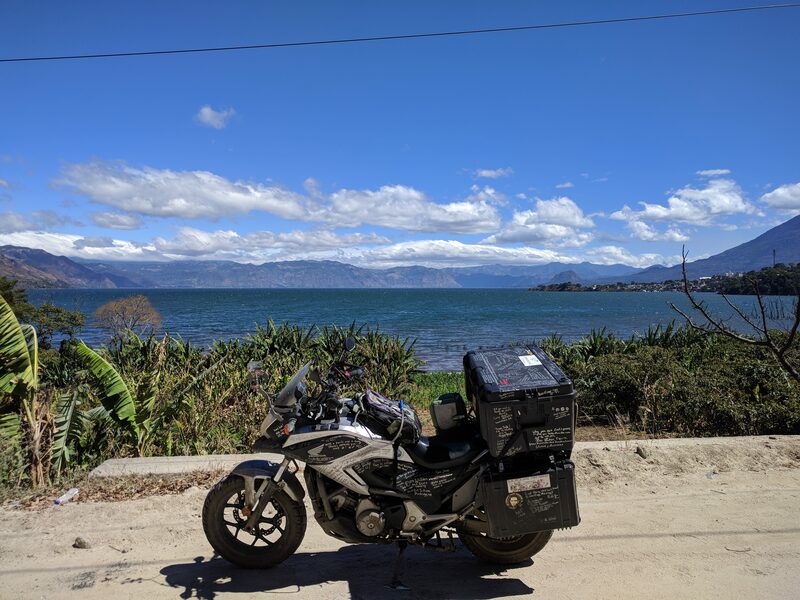 The rest of the road in Guatemala was quite nice…. …but there are always a few surprises. There were lots of little roadside stands selling whole pineapples, 3 for 10 Quetzales (about 40 cents apiece). It took a decent amount of restraint to not fill my remaining trunk space with fresh fruit. 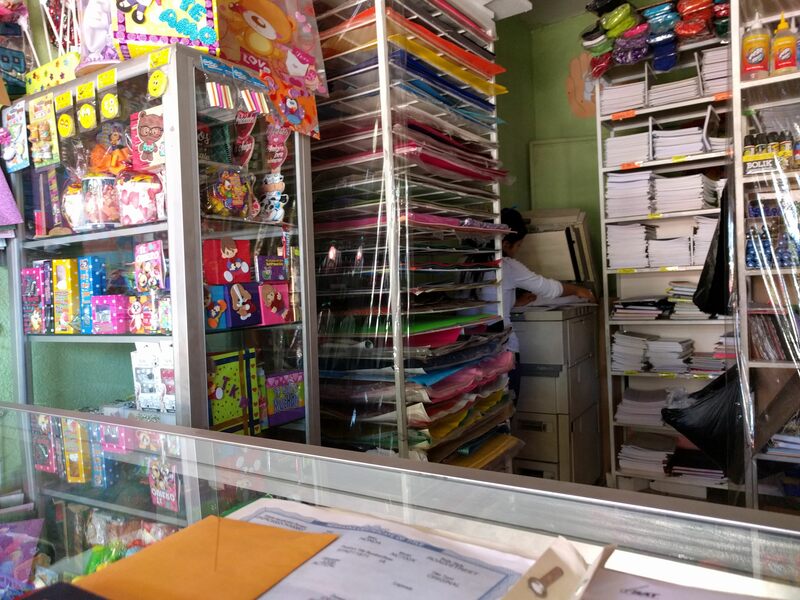 As I neared the border, I stopped at a little booth to try to make all the copies I would need for my border crossing. As I neared the border, guys waved large stacks of money at me. Perhaps they wanted me to take off my clothes, but I think it is more likely that they wanted to exchange money. One of them sprinted after me and was present by the time I locked up my helmet. 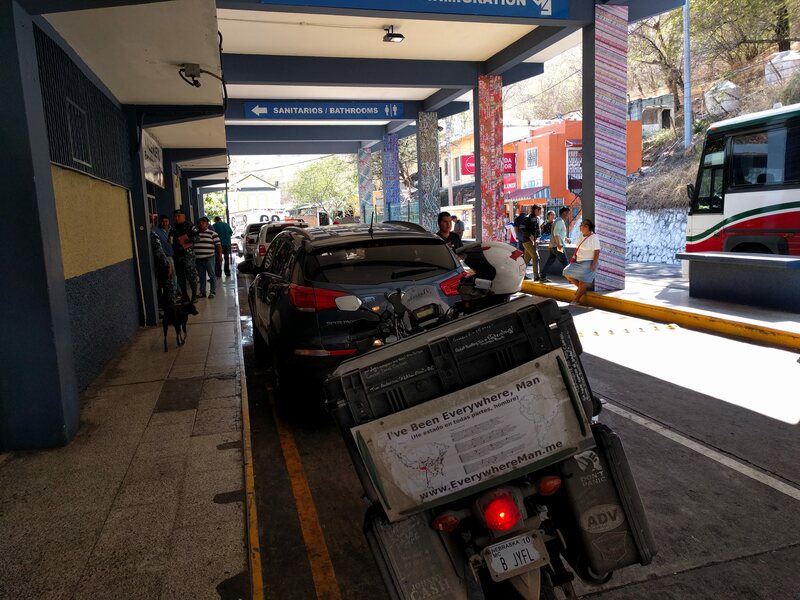 I told him that I would exchange money later, since I wanted to make sure that there were no more charges in Guatemalan currency. He decided to send his young apprentice with me, who accompanied me through the rest of the procedures in Guatemala. Migration and customs probably took about 45 minutes. It was a fairly painless process. But when it came time to change out the rest of my Guatemalan Quetzales, I got got. Now let me say this: I do pretty well with numbers. I have a minor in Mathematics. Some people assume that this means I can do any math problem instantaneously in my head. This is not the case, but I would say I’m at least above average in this area. They did the calculation on a little pocket calculator. I thought I would get about $20 (the currency for El Salvador is the US Dollar) for my Quetzales, but the calculator only showed $12. I knew it was wrong and asked them to type it in again. Same result. I was ready to get moving, so I just took it and left. A few minutes later, I realized the trick. Instead of dividing by the exchange rate, the guy with the calculator pressed multiply. I had not noticed that there was not a decimal point. I should have trusted my mental math. I was more embarrassed than angry, but I won’t fall for this trick again. 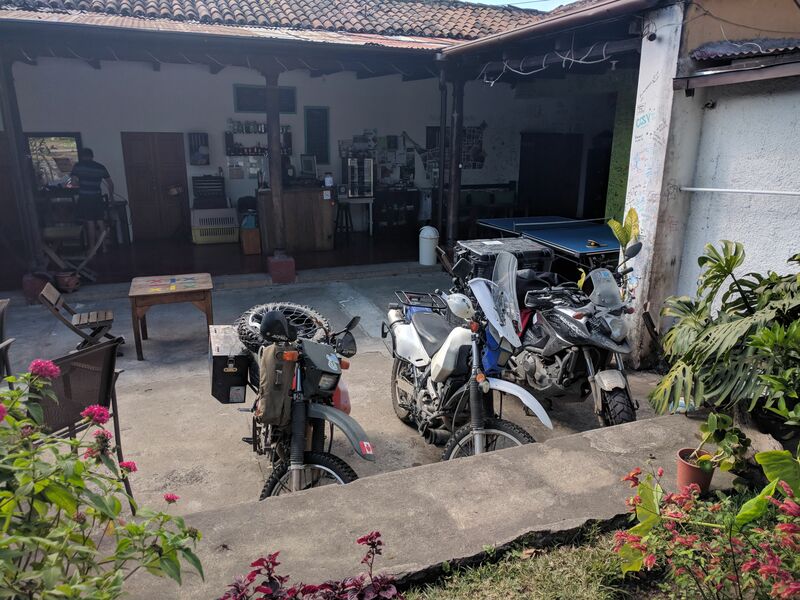 If you have to get robbed in Central America, this is surely the most preferable way. This was perhaps the most calm border area that I have encountered so far. They directed me to pull over right after the bridge and most of the paperwork was done under this little canopy. I’m going to stop there and do all of El Salvador in my next update. 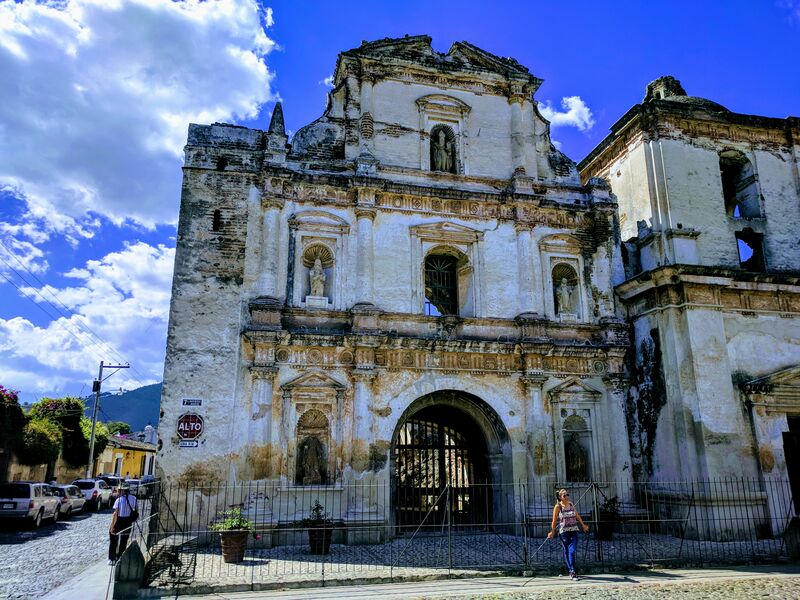 Other than my final experience, Guatemala was very good to me. I can’t believe the amount of things that I got to experience in just four nights. I can’t wait to come back. 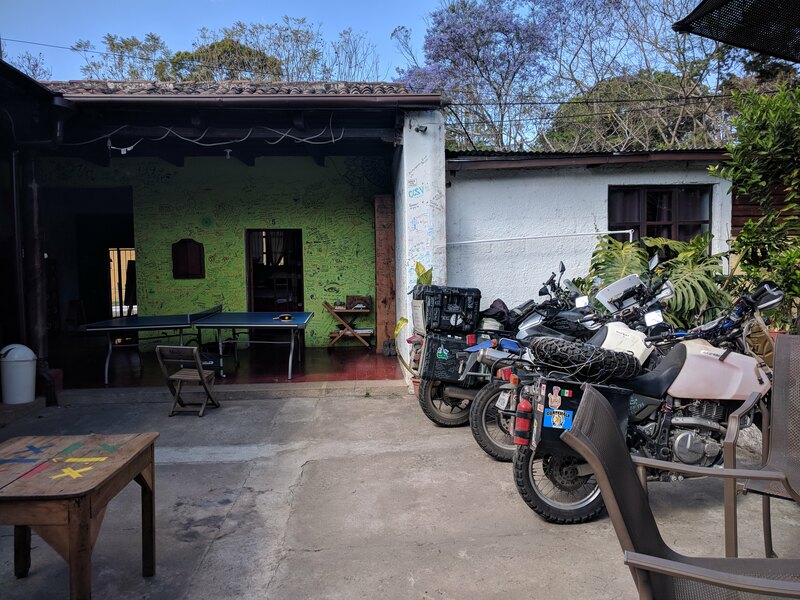 Realtime update: I’m safely into Nicaragua, currently in Esteli. 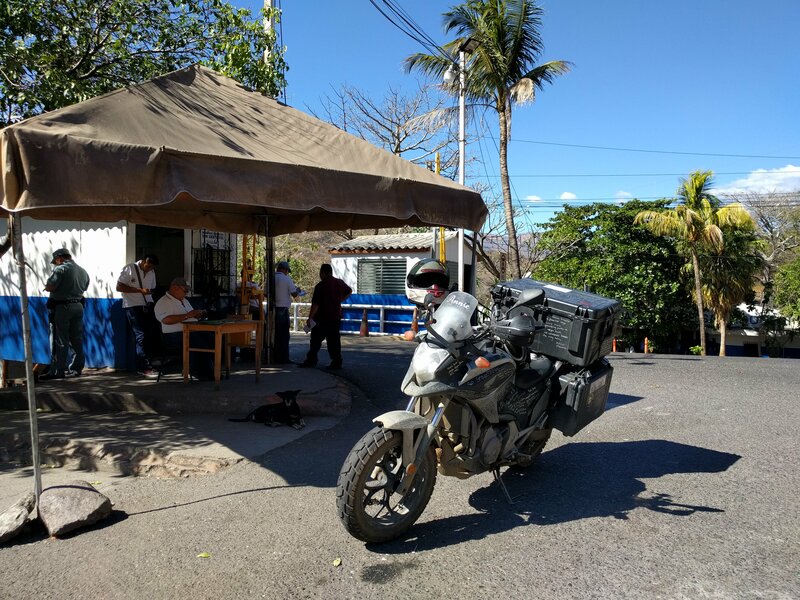 I crossed two borders yesterday, only spending a few hours in Honduras. So I’m curious. In an typical US hardware store the fastener sectional has a ton of SAE fasteners and a tiny section of metric. Is it the opposite in a country that uses the metric system as their primary method of measurements? I would assume so, but your visit to a hardware store has me curious. I really feel like these details should be included in the blog. 🙂 safe travels my friend. I’m Pamela Herrera, Elise’s friend. I wanted to let you know that my family is so happy to have you in Ecuador. They are eager to share with you the beautiful places and delicious food that my country has. I’m glad to see you’re closer and everything’s going good. Bless you! PD: I really enjoy to read your adventures, it’s amazing! Hola! Thank you so much for that! I just got to talk to Elise today and I am super excited about your generous invitation. We’ll be in touch! 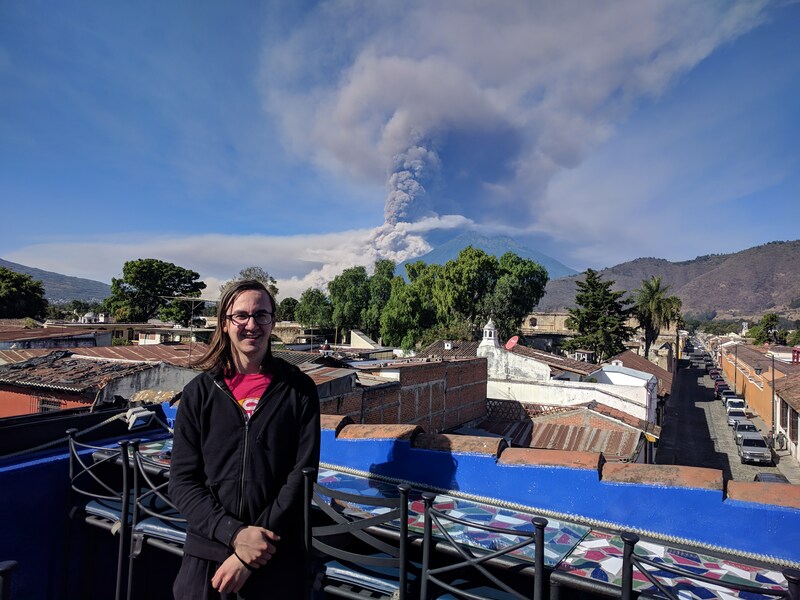 I’m jealous, you saw an active volcano! I love the pictures you take, Brett. Thanks, Uncle. I’m always trying to get better in this area. 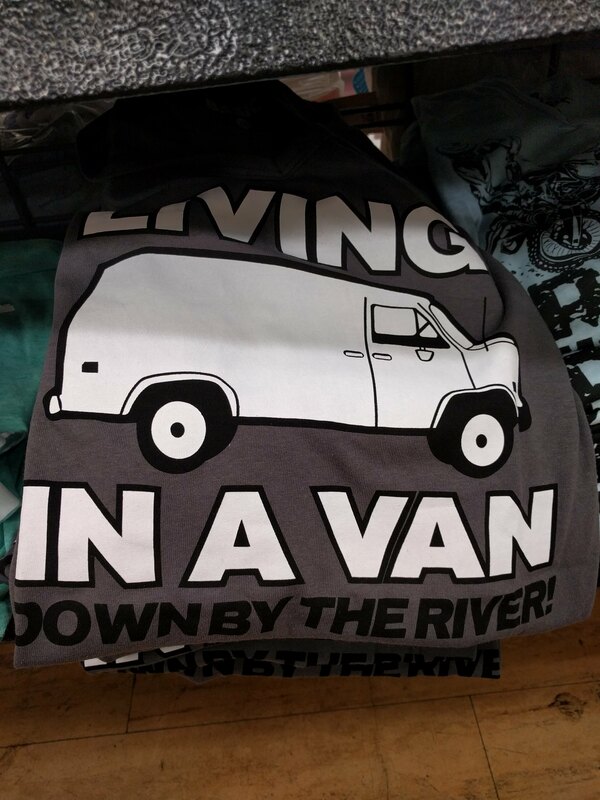 I still feel like a novice!